This is a hardy perennial plant of the celery family, grown as an annual and originated in the Mediterranean area. It is one of the herbs used to make absinthe, an alcoholic liqueur popular in France. 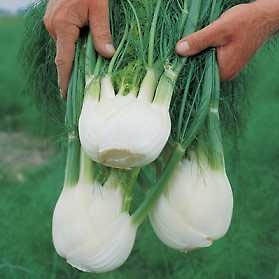 This delicious, versatile, aniseed flavoured bulb, is similar to the herb fennel. It can be eaten raw, sliced into salads or roasted. They can be tricky to grow because they bolt if exposed to low temperatures and the seedlings are sensitive to root disturbance. It is far better to sow thinly and directly into the ground in late spring or early summer when danger of frost is passed. Sow in 1 cm deep drills 45cm apart. Grow in succession to avoid disappointment should they bolt or are attacked by slugs. They prefer well drained soils, frequent watering, mulching and weeding. Earth up the stems to blanch them. They can easily be grown in containers in a small, urban garden. Sow directly into shallow drills to avoid root disturbance. 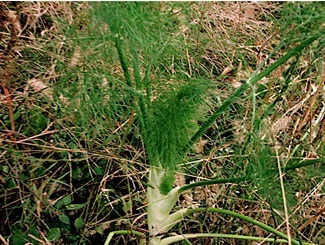 The crop can be harvested 14-16 weeks after sowing. Loosen the roots, cut off the bulb about 2.5 cm above ground. The roots will grow feathery shoots that can be used as an additional garnish to fish dishes. The bulbs can be stored in a cool place for a few weeks. A recommended variety is “Milano”, early, with good bolt resistance, large bulbs and excellent flavour.